MozPali Font. A simple homemade font with the diacritical marks for Pali transliteration. Needed for viewing Pali text sections of some versions of this website. Keyboard layout for MozPali — also on this page a keyboard layout for the SP Ionic Greek font. See: AmericanPictogram for the keyboard layout for this font. 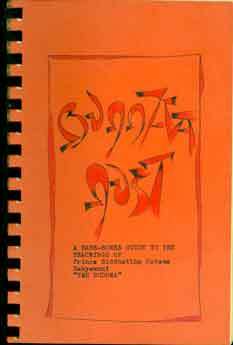 The obo translation of the Mulapariyaya Suttanta of the Majjhima Nikaya. This is formatted as a Word Document with the American Pictogram Font, suitable for printing out. The American Pictogram Font is included in the File. Warren's Textbook introducing Buddhism by way of translations from the Pali. A wide selection of sources organized by way of the Tripple Gem: Buddha, Dhamma, Saŋgha. Some oddities in the translation, and some choices one could live without, but all-in-all a great book for beginners. This is the html version, in compressed formats. You will need the MozPali Font (see above) to view the Pali diacriticals properly. This is a Zip file of a PDF Document of a book on Ch'an meditation technique by the teacher of another of my teachers, Venerable Lok To, the book's translator (I believe Sam Landberg is also an old acquaintance of mine). These are zipped pdf files for downloading to your computer. Be warned! They are all large files. With the exception of the volumes of The Book of the Discipline, all the suttas in these volumes have been converted to html files which can be accessed individually from the Index. 2. Check out the available resources in the Index. These include the Patimokkha in the Rhys Davids/Oldenberg translation and Bhk. Thanissaro's version. The Pali English Dictionary, Rhys Davids and Stead. Zipped text file in unicode utf-8 with PC line endings. The Bhikkhu Ñāṇamoḷi 3-volume manuscript used as the basis for the Bhk. Bodhi edited edition. "Manuscript" here means hand written! and his script is no easy thing to read. This is a Zip file of a PDF Document. David N. Snyder, Ph.D.: The Complete Book of Buddha's Lists — Explained. L.S. Cousins, Journal of Buddhist Ethics, Vol. 4., Sep. 1, 1997. Review of Bhk. Bodhi's edited edition of Ñāṇamoli's translation of the Majjhima Nikaya, Middle Length Discourse of the Buddha. A zipped e-pub edition of the first iteration of The Pali Line c 1987. The original was typewritten. This version has been reset using Times Roman. The illustrations are from the original. Some very slight editing. Handy as a quick reference to one way of organizing the Dhamma. 74 pages. File Structure Template. A set of empty folders for organizing suttas in the Pali Cannon. The translations of the Four Nikāyas by Bhk. Sujato and his computer. The Travels of FA-hsien, (399-414 A.D.), or Record of the Buddhistic Kingdoms, H.A. Giles, M.A., re-translation. From the Introduction: From this little book of travel the unbiassed reader may perhaps obtain a furtive glimpse of the gradeur of the Buddhist religion in the early years of the 5th century A.D.
Sacred Books of the East, Volume 21: Lotus of the True Law. A Mahayana Sutta. Included here because occasionally referenced in footnotes.